I guess I’m on a breakfast kick; oatmeal, now pancakes! Breakfast is my favorite first meal of the day. Pancakes are a classic breakfast and are easily adaptable to whatever you have in the house and or dietary needs. They are also a wonderful comfort food. I have fond memories of pancake eating contests with my brothers when I was growing up. Yes, I won. Again we will do a simple recipe, then some variations and a discussion on how to make decisions when you are developing your signature pancake recipe. Mix flour, baking powder or soda, and salt, mixing to combine dry ingredients. Add the curdled milk, mashed banana, and vanilla whisking the ingredients until they are uniformly wet and combine. Heat your favorite pancake pan over medium heat. I use a large cast iron pan. Once your desired pan is hot heat a little oil in the pan, I use about a teaspoon per batch, and pour the batter into the hot pan. I usually make one big pancake at a time, but you can also do smaller ones and do however many fit in your pan. Cook on one side until the sides of the pancake are starting to look dry and bubbles are forming, popping, and not closing, and the cooked side is turning a delightful golden brown, about 2 minutes. Flip pancake and cook until the second side is also golden brown, about 1 more minute. Serve piping hot with topped with maple syrup and butter, or topping of your choice like this cinnamon roll topping. What is important for successful pancakes? Flour. For a happy pancake you need to start with flour. I have only used grain based flours which is what I will talk about here. You can use any combination of flours that you have in the house. I usually use an all purpose wheat flour. I have also mixed in oat flour, cornmeal, whole what flour, buckwheat, and even bread flour when I ran out of all purpose. To be successful you will probably want the majority of your flour to be wheat flour to bring the texture you are seeking. I will post a gluten free recipe soon for those of you not into wheat. Liquid. The flour to liquid ratio is important for the finished product. More liquid creates a runnier batter and a thinner pancake. Less liquid is a thick batter and a dense pancake. You need something that balances both for a light fluffy pancake. About 4 parts flour to 3 parts liquid seems to be a good ratio. This is something you can play with quite a bit. I no longer actually measure my liquid and just pour it in until it is the consistency I am looking for. Egg Substitute. You need something for the egg in pancakes, either egg, or another ingredient to build structure in you pancake. Options I like include; egg, chia seeds (1 TBL chia seeds mixed with 1/3 cup water), banana, and egg replacer powder. You could simply take out the egg which would give you a thinner, floppier pancake. My go-to egg substitute in pancakes is banana and I always use them when I have them in the house. They give a wonderful touch of sweetness and good structure to the pancake. Leavening agent. Either baking powder or baking soda. With baking soda you also need an acid. This creates the chemical reaction needed to give your pancakes lift. This is why I call for the apple cider vinegar if you are using baking soda. 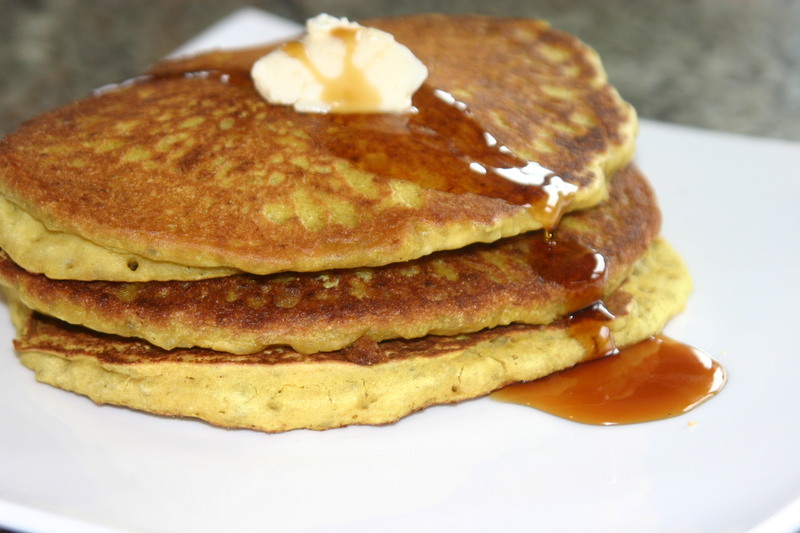 The baking soda and vinegar will give you a bit more of a buttermilk pancake taste. Flavor. Salt, vanilla are added here for flavor. Other options include any extract you can think of, spices like cinnamon, cocoa powder, and zest from citrus. Other. One of the delightful things about pancakes is the add-ins. We are all familiar with blueberry pancakes. Other options are any fruit you can think of, protein powder, cheese, chocolate chips, nuts and seeds, even vegetables like some grated carrot or zucchini. For most of these you want to add them into the pancake after you have poured the batter into the pan. This way your pancakes will look amazing, and you will be able to control how much goes into each pancake. You can also make toppings and go crazy with your combination. Maybe start with this cinnamon roll topping.